TRE Dynamics are technical partners with Ohlins DTC, Germany. You can see in the video, the shaker rig forcing vibrations in the suspension. About half way through, they show you a "track replay". The actual suspension movements from the track are reproduced. To minimize disturbance at the tyre contact patch, you need the required "natural suspension frequency" or "suspension frequency", as we regularly call it. The "natural suspension frequency" is the vibration of the suspension applicable if, once the suspension is displaced, it is left to it's own devices. No further external force applied, no friction and no damping. When the external forces are applied to the car, together with the input from the driver, the resulting vibration is highly dependent on the natural suspension frequency. With experience, we are able to build up a pretty good idea of what suspension frequency is required to make best grip, for both racing and road performance. Suspension frequency is our key measure of suspension stiffness. It is measured in Htz, Cycles per second, or CPM, cycles per minute. With shaker rig testing and highly trained engineers we could match the springs and shocks together, to achieve best grip. But without the shaker rig, we start by specifying the springs first, and then we can decide on the shock valving later. We determine what suspension stiffness (suspension frequency) we need by comparing with other race cars. The forced vibrations we see in the video can be modified by changing the suspension stiffness ie changing the springs. This is the first item we look at in suspension set-up - what springs do we need? Of course, the system does require shock absorbers for best grip. But springs are the first priority, even if you had the very best shocks quality shocks fitted. Choose the springs - then decide on the shock valving. Suspension frequency is comparable between all road and race cars. We have developed a scale of suspension stiffness through experience with 100s of set-ups. We can show you what suspension frequency will be a good starting point for the baseline set-up of your particular race car. Determining the suspension frequency you need, and the applicable spring rate, is the first step in our on-line training course in suspension tuning "Get More Grip and Better Balance"
Where Does Grip Come From? How Do We Make Grip at the Tyres? In the video, a rally car is being tested on a 7 post shaker rig. The posts are hydraulic rams that put forces into the suspension representative of the inputs the car gets from the road surface. In the "track replay" test in the video, the rams are displacing the suspension as per the suspension movement recorded on the data logger for the track in question. When you see a road car on the shaker rig, you see the body remaining stable and the suspension cycling up and down - the set-up the engineers want for best ride. In racing, the only objective is to go fast. One of the main limiting factors is how well the tyres stay in contact with the track surface. The basic use of the shaker rig is to optimize the springs and shocks to minimize tyre load variations, thereby optimizing the dynamic grip available at the tyres. For optimum grip - ie least cycling motion of the tyre contact patch up and down, there must be significant motion of the body of the car. The ride will not be smooth as it was for the road car. So, we need stiff springs for racing to create grip. We can relate the cycling of the suspension up and down to a given suspension stiffness that optimizes grip. This measure of suspension stiffness we call the "natural suspension frequency". ie the cycling of the suspension in cycles per minute (CPM), resulting from an external disturbance. We do a simple calculation of suspension frequency, assuming no friction and no damping. It is one of the most important numbers we have for determining the set-up we want for our race car. 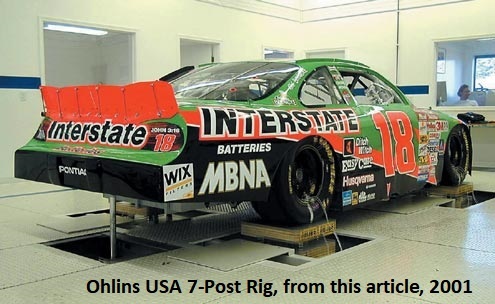 “The 7 Post Shaker Rig” is based on an article by Terry Satchel, from Circle Track Magazine Dec 1, 2001. Terry Satchel, now retired, is an engineer and author highly influential in the world of vehicle dynamics. Most significantly for us, he was a contributing author of Chapter 16, “Ride and Roll Rates” in the racer’s bible, “Race Car Vehicle Dynamics” - the mathematics behind the calculations we use in the Racing Car Technology Weight Transfer Worksheet™. At the time of writing this article, he worked for Ford Motorsport. What is a seven-post shaker rig, or the four-post rig for that matter, and why would anyone in grass roots racing be interested? Will you ever need to use one? Since Terry Satchel wrote this article in 2001, the shaker rig has taken over in professional racing – perhaps with many now also placing equal importance on K & C (Kinetic and Compliance) testing. Keen amateurs with the budget are into it as well. But the cost and availability keep it largely out of reach as a tool for grassroots racers. Essentially, the shaker rig can tell you where the best grip is in the set-up by helping you to choose the right spring and shock package, while the K&C test rig can tell you how to find more grip with improved chassis and component stiffness and suspension kinematics. So to give you a concrete answer, yes, if you’re modern made for purpose race car has come from a manufacturer making a number of vehicles, then 7 post rig testing has formed part of the development task of coming up with the spring and shock recommendations for racing shown in your owner’s manual (or factory bulletins). However, at a cost of thousands of dollars per day to run, it’s unlikely you or I will ever run our cars on a 7-post rig. The main value for us studying the 7-post rig procedures, is to build a better understanding of how the race car creates grip, so we can choose the right springs and shocks for our older factory race car, or non-factory, non pro racing race cars – open wheeler, sports racing or production-based race car. This knowledge feeds right to the heart of the key concepts and guidelines for choosing springs and anti-roll bars we give you in our on-line training course, “Get More Grip and Better Balance”. The shock absorbers control the body motions as well as the wheel motions. What Does This Mean for us in Set-Up for Grass Roots Racing? This is how we see this playing out at Racing Car Technology. The driver will lose his or her way if trying random adjustments to try and achieve the driver’s preferred body control, as implied by Terry’s comment. At least as far as grassroots racing is concerned, we think starting with a known baseline set-up is the key. There’s no room in our thinking for the driver saying “I’d like the car to move around a bit more”. If you did soften out the springs and/or shocks from the baseline, in all likelihood, the car would just be slower. The challenge is to understand from a practical perspective what is important in maintaining best grip at the tyres vs driver preference. It is not possible for the driver to determine what is best for the set-up just by driving the car. You have to start with a known baseline set-up and working in planned steps, get the driver to try variations to see what is faster and better suited to the driver. In practical terms, we start with the spring stiffness we have determined is a good starting point for our application. Choosing spring rates has been Our Number One set-up priority at Racing Car Technology. Shock selection and tuning comes next. We need shocks that have reasonable damping effect. Very low damping level will kill grip as discussed in Terry’s article. The car could be dangerous and undriveable. But for grass roots racing, once we have a ballpark shock for the spring we have in the car, it is pretty much OK for what we want to do, including moderate spring changes without changing the valving. We do not need the same precision regarding the shock setting as we do for the spring. We have the experience with David Stone’s Mazda MX5, where the well-known brand shocks we used at the rear were too stiff, even on their softest setting. The car was fast. It could win races. But we always had a question mark in our minds about the balance - a touch too much oversteer, but we couldn’t get it out by adjusting the anti-roll bars. What was happening? It turned out the too stiff rear shocks were restricting the car in roll at the rear, causing the oversteer. We built our own rear shocks (QA1 Motorsport), achieved the extra travel in the suspension and better balance we needed, and pulled a few tenths out of the lap time. In general, drivers prefer relatively stiff damping compared to the damping giving least load variation (ie best grip) at the tyres. Claude Rouelle suggested in a seminar I attended, that drivers may settle for damping around 50% stiffer than indicated by the 7-post rig. It’s what feels the best to them – what gives the driver greater confidence to push hard. However, we have to keep in mind that what feels best to the driver may be giving away grip at the tyres. The shocks can easily be set too stiff for least load variation (ie best grip) at the tyres, and possibly balance as well, as per our example above. With many of our clients gaining seconds improvement in lap time, it’s clear the majority of this improvement is due to the better optimized springs. Using the Racing Car Technology Weight Transfer Worksheet™, I will show you how we calculate the current suspension stiffness. Then, using our measure of suspension stiffness, the suspension frequency, we can say from experience with 100s of set-ups, what suspension stiffness will work. Suspension frequency in grip terms is comparable between all race and road cars. For production car racing, spring frequency required will be way more than after-market sports springs. After market springs may be 50% stiffer, for instance, while the correct racing spring may be 4 times as stiff as the production springs. If we have the necessary data logging, and expertise with the appropriate vehicle dynamics software, then greater precision in selecting springs and shocks is possible without having to go to the extent of the 7-post rig. These procedures are beyond what grass roots racers can do. So our simple procedures at Racing Car Technology are a good solution. Simple and low cost to implement, yet satisfactory calculation of the baseline set-up.